A weekly debate is held where a wide range of topics and issues are discussed.A weekly debate is held where a wide range of topics and issues are discussed. The students often come up with the motions themselves. We believe that debating and public speaking improve students confidence and communication skills. 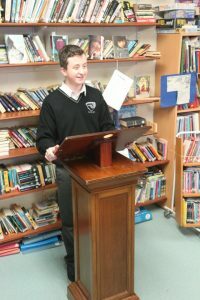 Students from Coláiste Pobail Acla have taken part in the ‘Phil Speaks’ public speaking competition and the ‘Western Task Force debates on The prevention of drug and alcohol abuse’. Students are given the chance to develop their own ideas, which can be very useful for college or work in the future.